Today was my third half marathon. It was a great day. Temps started in the low 40's and finished in the 50's. It was also sunny with just a little bit of wind. My running buddy and I got to the race at about 7:30am, exactly when the race said to be there. We probably could have come a little later but we were there. The race actually started just around the corner from where I used to work so I knew the area very well. We walked around a little. There were more than enough port-o-potties around the area and we didn't have to wait at all. That's a first. Race time and Garmin time were exact! As you can see above, I was following my plan and following the pacers and then BOOM, I had had enough of the slower pace and took off. I was actually surprised that my splits were fairly even except for mile 12. I don't know what it is with mile 12 but I always seem to slow down in that mile. Also, at the last part of the race after mile 13, I slowed down a little since I was ready to puke and there was about 1,000 people at the end of the race. That would have been quite embarrassing to puke in front of that many people so I slowed a little and caught my breath and that kept me from embarrassing myself. Overall, a nice race and I would probably do it again considering it's only 20 minutes from my home. 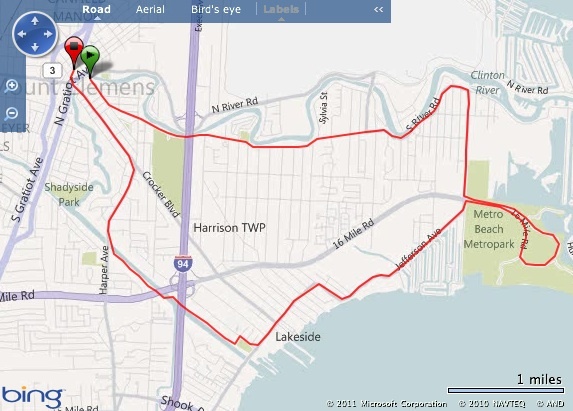 It is nice having a race that close to your home. This is my running buddy and I before the race. This is the corral that I was talking about. It was kind of different from other races I have ran but it ended up working out fine. The race had water, orange slices(yum! ), banana's and apples to eat at the end of the race. They also had a band at the end of the race and a couple bands on the course including an Elvis impersonator which was nice. While I did not use them much, it was nice that they had pacers out there for people looking to meet a certain time. I know there are no pacers for my Full marathon next month but I wish there were to help keep me going. Wow! Congrats on the PR :) very impressive! How are the legs feeling? Did you do an icebath? Another great race! I love how they finish as planned. Wow those are some textbook splits! Good job! Good job Mr. Consistent! You had a great morning weather-wise. The wind was non-existent. Stony Creek was really empty today! Great job!!! I agree with you about the route not being that scenic, but overall I thought it was a great first year for this race! One thing worth mentioning, since you are faster than me is that when I finished (just above 2 hours), they were out of water. I run with my fuel belt so I had some but others did not, so I thought they could have been more prepared in that regard. Anyway, here is to a great day and a great race! Congrats on the PR, Jeff! Wow, great job and congrats on the PR!! What a great job with the PR! Love the medal! Great Job!! 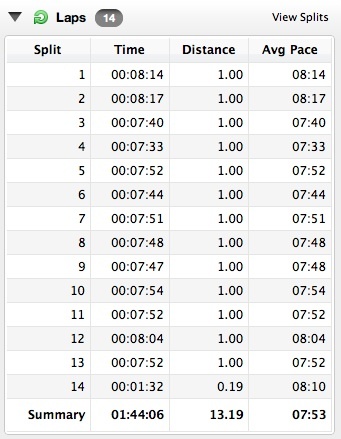 So jealous of your pace splits! Congrats on a great race! It really does make a difference on a course if there's something interesting to look at--keeps your mind off of what your legs are doing. I can't wait to use my Garmin in a race. Congratulations on the PR! That's great even pacing. Congrats on the PR! That's awesome! awesome time!! It's really not fun when they don't close the streets. Passing is awful and you're never really sure if the cars are going to kill you or not. Amy - that's terrible. I would not have been happy with no water at the end. Ken - you should have come out and raced! Congrats on the PR!! Sometimes it is better to listen to your body and not your training plan. Congrats on the PR - wasn't it a perfect day? I'm glad to hear it went so well for you and that you have no pain afterward. Too bad I missed you. Wow, congratulations on the unexpected PR!